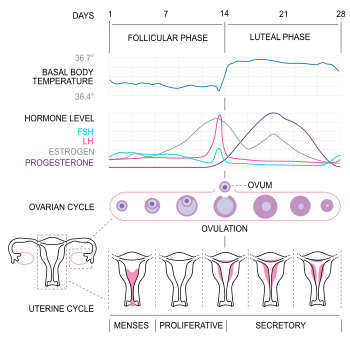 The luteal phase is the latter phase of the menstrual cycle (in humans and a few other animals) or the earlier phase of the estrous cycle (in other placental mammals). It begins with the formation of the corpus luteum and ends in either pregnancy or luteolysis. The main hormone associated with this stage is progesterone, which is significantly higher during the luteal phase than other phases of the cycle. The opposite of the luteal phase, the rest of the two weeks, is called the follicular phase. Several days after ovulation, the increasing amount of estrogen produced by the corpus luteum may cause one or two days of fertile cervical mucus, lower basal body temperatures, or both. This is known as a "secondary oestrogen surge". 1 2 3 4 Losos, Jonathan B.; Raven, Peter H.; Johnson, George B.; Singer, Susan R. (2002). Biology. New York: McGraw-Hill. pp. 1207–09. ISBN 0-07-303120-8. 1 2 Weschler, Toni (2002). Taking Charge of Your Fertility (Revised ed.). New York: HarperCollins. pp. 361–2. ISBN 0-06-093764-5.